Madhya Pradesh Police Department is now going to conduct physical test for constable (Aarakshak Sanvarg / Pradhan Aarakshak / Sahayak upnirikshak) posts. Earlier written exam was held for which qualified candidates have to go through this test. Madhya Pradesh Police Department had completed the process of getting applications for 14283 posts. For appearing in this test, aspirants have to download the admit card without which no entry will be allowed. Now the physical exam is scheduled to be held in upcoming days. The Admit card of MP Police constable physical test will be released shortly. Those candidates who had qualified written test, can download MP Police constable Exam Admit card from the direct link given below. MP Police had conducted physical exam for constable posts. For that, admit cards are going to be available. The written test will be held by Madhya Pradesh Professional examination board (MPPEB) or MP Vyapam at various venues located in the state in morning and evening sessions. Candidates have to download MP Police admit cards from the official website vyapam.nic.in via the direct link given below. The test will be held at various centres in Madhya Pradesh state. All the important details like exam venue, roll no., date and time etc. had been shown in the call letter. 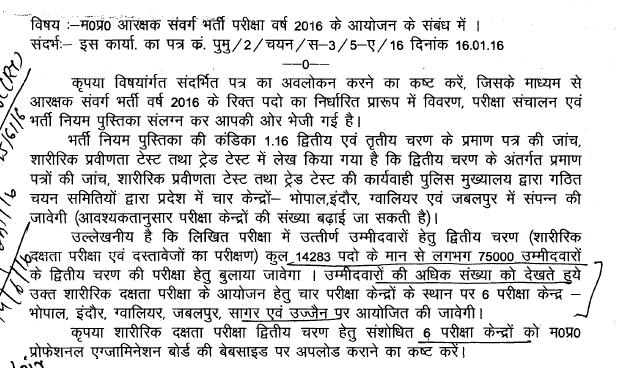 Earlier Madhya Pradesh Police Department had invited applications for constable posts for which application forms have been filled up to 11.05.2016 using MPOnline Portal. Among these 14283 posts, 12006 are of Constable (GD). A total of 75000 candidates will be called for second round of this recruitment i.e. physical test. The written examination consists of two papers. Paper 1 is for all posts while paper 2 is only for Head constable and ASI posts. The paper 1 have multiple choice objective type questions to be answered in 2 hours. The candidates can download their admit card from MP Police website from here. The admit card should be printed and brought on the test date with one black ball point pen. Also they should bring one photo id proof like voter id, aadhar card, Driving license, Passport, Bank passbook having photo. E-aadhar is not valid. Only those candidates will be given entry who shows the download MPP Admit card. Mobile phones, Calculator, Log tables, whitener or any other wrong means are not allowed in exam room. In order to download the admit card for MP Police constable exam, candidates need to visit the direct link provided here (after release). It will take you directly to download page. Then candidates need to enter their registration details and click submit. Their MP Police constable Admit card 2016 will be shown and you have to take the print.